Charles F. Coughlin of Hartford worked for Aetna Insurance Company prior to the outbreak of World War I. During the war he served in the 102nd Infantry, a national guard unit that made up part of the 26th Division (known as the “Yankee Division”) of the American Expeditionary Forces in France. Coughlin enlisted as a private on June 24, 1917, at the age of twenty-six and was later promoted to corporal and then sergeant. His letters home to his mother bring to life some of the conditions in France and the soldier’s experience of war. In the fall of 1918, the 102nd Infantry was involved in the Meuse-Argonne Offensive. Coughlin was wounded in battle on October 23, 1918, and died on October 27, just weeks before the armistice. 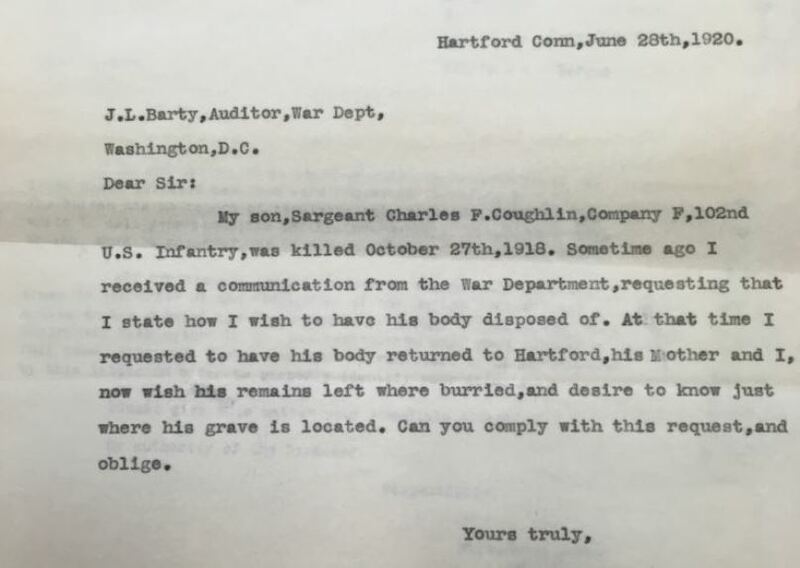 Letters to and from Charles’s father, Edward E. Coughlin, regarding the details of his son’s death, burial, and personal effects reveal something of the level of confusion and chaos that existed at the end of the war. In addition to the materials at the Connecticut Historical Society included in this activity, we know about Coughlin’s background and service from the military questionnaire completed by his father after the war, which is held by the Connecticut State Library. How do you measure the cost of war? How did Connecticut soldiers serving in Europe experience the war? What personal hardships did soldiers endure? What observations did soldiers make about France and the experiences of the French people during the war? Did soldiers see a value to their service in France while the war was going on? What struggles did the families of fallen soldiers face in trying to gather information about the death of their loved ones? 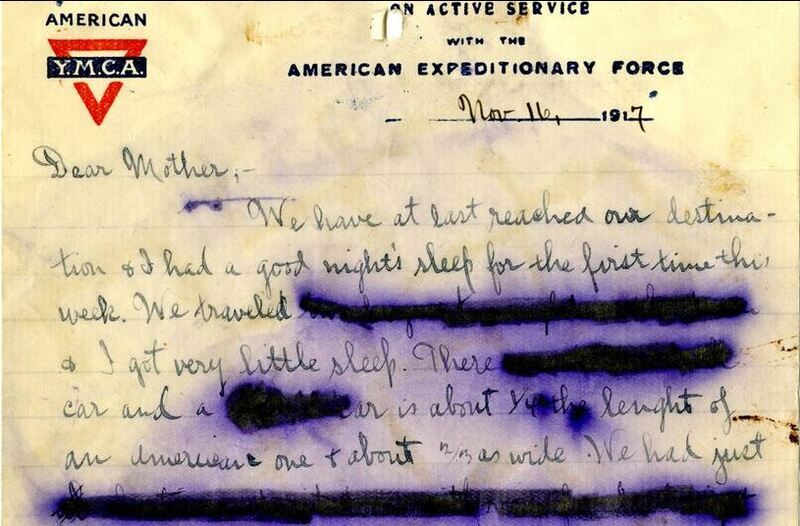 Letter from Charles F. Coughlin to his mother, November 16, 1917. Matthew E. and Charles F. Coughlin World War I correspondence and memorabilia, 1879-1921, mss 66232. Connecticut Historical Society. 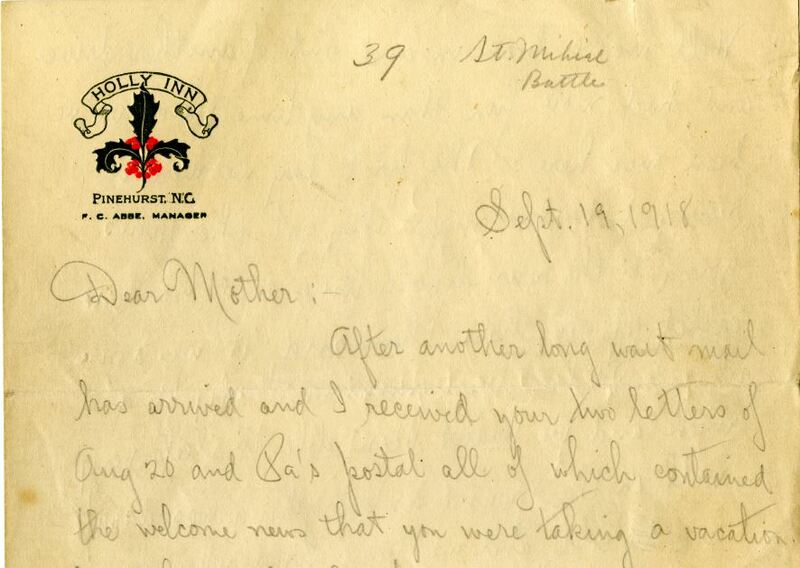 Letter from Charles F. Coughlin to his mother, September 19, 1918. Matthew E. and Charles F. Coughlin World War I correspondence and memorabilia, 1879-1921, mss 66232. Connecticut Historical Society. 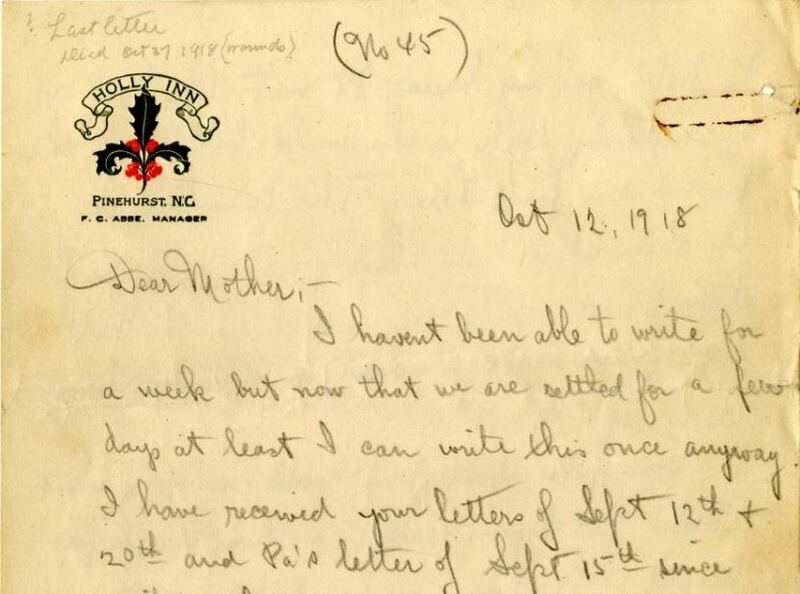 Letter from Charles F. Coughlin to his mother, October 12, 1918. Matthew E. and Charles F. Coughlin World War I correspondence and memorabilia, 1879-1921, mss 66232. Connecticut Historical Society. Letter from Edward E. Coughlin to Miss A.B. Sands, Executive Secretary, Connecticut State Council of Defense, January 8, 1919. Matthew E. and Charles F. Coughlin World War I correspondence and memorabilia, 1879-1921, mss 66232. Connecticut Historical Society. 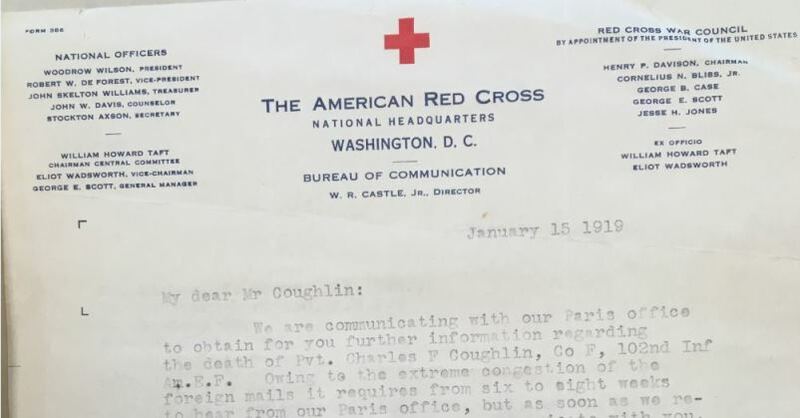 Letter from W.R. Castle, Director, Bureau of Communications, American Red Cross to Edward E. Coughlin, January 15, 1919. Matthew E. and Charles F. Coughlin World War I correspondence and memorabilia, 1879-1921, mss 66232. Connecticut Historical Society. Letter from Edward E. Coughlin to J. L. Barty, Auditor, War Department, June 28, 1920. Matthew E. and Charles F. Coughlin World War I correspondence and memorabilia, 1879-1921, mss 66232. Connecticut Historical Society. 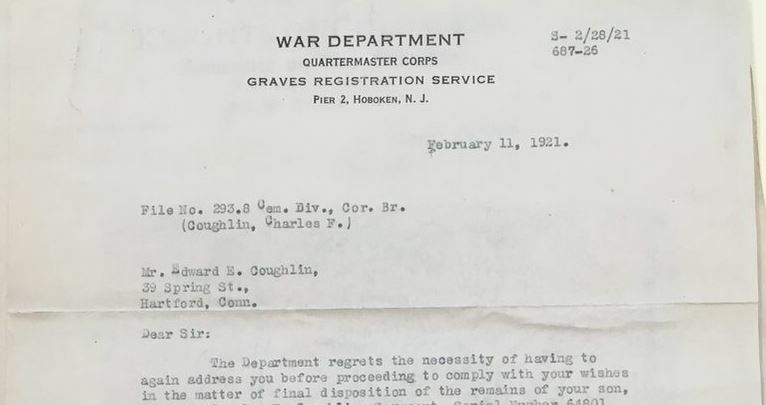 Letter from J. F. Butler, Graves Registration Service, War Department, February 11, 1921. Matthew E. and Charles F. Coughlin World War I correspondence and memorabilia, 1879-1921, mss 66232. Connecticut Historical Society. Introduce the compelling question and discuss possible supporting questions to guide the inquiry. These may include those suggested above, others generated by students, or both. Note that this compelling question could guide a series of inquiries using primary sources beyond those included in the toolkit for this activity. Present Charles F. Coughlin’s background, although you may wish to withhold the information about his death until later in the activity. Working individually or in pairs, students will examine the letters written by Charles F. Coughlin in 1917-1918, using SOAPSTone analysis, the Library of Congress Analyzing Primary Sources process (PDF – worksheet), or another method of your choice. Students may look at all three letters or be assigned different letters to examine and share with their classmates. What can students KNOW from each source? What is the evidence? What can they GUESS or infer? Based on what? What does each source make them WONDER? Revisit the supporting questions and add new student-generated questions to the list for further inquiry. Share the details of Coughlin’s death, if you have not already, and distribute the second set of letters—those to and from Charles’s father, Edward E. Coughlin. Students may look at all four letters, or students may be assigned different letters to examine using the same process as above and then share with classmates. Revisit the supporting and compelling questions and discuss what further inquiries students might make in order to come to a more complete, informed response to the compelling question. Students will conduct research and identify additional World War I primary sources to help them respond to the compelling question. These might be photographs, posters, letters, diaries, or government publications. Students will compare the information gathered from these sources to that found in the Coughlin materials. To get started, try some of the “Additional Resources” listed below. Students will conduct a fundraiser or collect donations to support an organization serving veterans in your area. Students will research the U.S. Department of Veterans Affairs —its history, role, and services—and then find recent newspaper articles online discussing current issues related to the VA. Students will write a letter to the editor in response to one of these, making specific reference to historic events. Visit the Connecticut Historical Society’s Waterman Research Center to view more materials relating to Charles F. Coughlin or other World War I letters in their collection. CTExplored.org: “Restoring Connecticut’s Lost World War I Memorial” by Lynn Ferrari and Greg Secord. Connecticut Explored. Summer 2015, Volume 13, Number 3.